Living history is littered with “accidental finds.” Three years ago a book fell from my lap and opened to a photo of a trade ax, attributed to my time period, recovered from Long Lake, near Hastings, Michigan, which is about 65 miles from the River Raisin as the crow flies. After much research, I asked John Cummins if he would make a copy. John is one of several blacksmiths in residence during the National Muzzle Loading Rifle Association national shoots, and he has hand-forged 18th-century accoutrements for me in the past. Hafting the Long Lake ax, as I came to call it, was more of a chore than I thought it would be. As I worked the third handle down with the draw knife, I mulled over sheath options. Before the head was cool my mind conjured up visions of a leather sheath and shoulder carrier similar to the one attributed to Alexander MacKenzie. The MacKenzie sheath features a full leather “envelope,” with diagonal tooling, a short leather section sewn to fit the ax’s handle and what looks like an inkle woven strap. 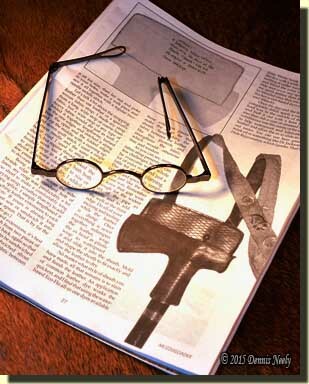 For those interested, in the last half of “Buckle Yer’ Belte, Boy” in the May/June 2011 issue of MUZZLELOADER, T. C. Albert shared a how-to article on re-creating the MacKenzie sheath. Prior to acquiring the Long Lake ax, my trading post hunter persona carried a small belt ax hand-forged by the late George Ainslie, protected in a flapped, cowhide sheath with a narrow, fixed-length leather shoulder strap. When I started formulating the returned captive characterization, I scavenged clothing and accoutrements from the trading post hunter’s closet. The Ainslie belt ax didn’t last more than a few hunts—both the style of the ax and the sheath that held it simply did not fit the impression. I switched to a copy of an 18th-century tomahawk hammered out by David Monds, a seventh-generation blacksmith whose ancestors supplied tomahawks of this pattern to the Hudson Bay Company. I tucked the tomahawk in my sash, first in the front, then in the back. Over the course of a few rigorous outings, the bit’s sharp corner drew blood at the base of my thumb and on another occasion, nicked my trigger finger. For safety sake, I set the HBC tomahawk aside, content to wait on completing the Long Lake ax. In essence I took the advice I give to any traditional black powder hunter with an authenticity issue: I stepped back, set aside all my “gee, wouldn’t it be nice thoughts,” took a deep breath and started researching as if this was a new, never-before-asked question. John Tanner’s narrative includes a number of references to “tomahawks,” but includes no descriptions of the style ‘hawk he used and no clue as to any type of carrier. It is tough when a hunter hero offers little or no help, or did he? As I thumbed through all of the tomahawk or ax references his narrative contains, I realized how valuable this tool was. An ax or tomahawk was always at hand and always ready for immediate use. Eighteenth-century portraits and illustrations show Native Americans holding a bare tomahawk. I believe symbolism plays a big part of the inclusion of the tomahawk by the painter. Even the much referenced painting, Soldiering for the King, 1780 by an unknown artist, depicts a bare pipe tomahawk held in Sir John Caldwell’s left hand. This painting style is carried well into the 19th century. To date, I find no image of a carrier or covering for the ‘hawk in the Native American context for the lower Great Lakes region, but that is not to say one does not exist. Henry continues on in graphic detail about the consequences of that unfortunate accident, but his observations leave little doubt that the razor-sharp bit of the hunter’s ax was not covered, and further, the ax was tucked in his belt. Thank heavens my experimentation with a bare tomahawk tucked in my sash only resulted in a couple of small cuts. Although the goal of traditional black powder hunting is to experience the texture of life in another time in the same manner our hunter heroes did, losing a hand or suffering a life-threatening cut in a period-correct fall is not acceptable. With safety my primary concern, I opted for a simple blade cover for the Long Lake ax.